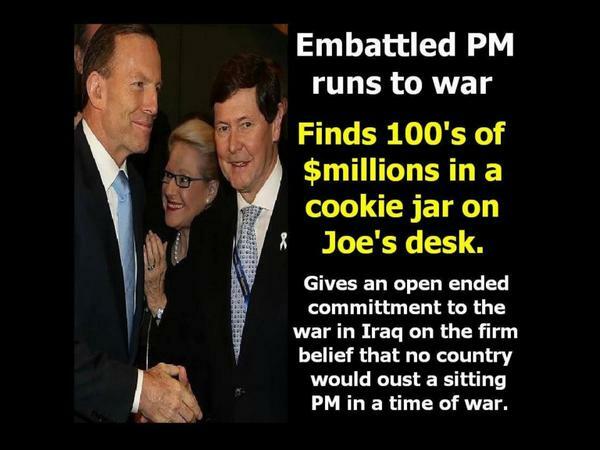 Well Mr Abbott is caught in a moral tangle surprise, he says going to war with ISIL is a criminal offence, which of course it is. However should our heroic Diggers do it, its not illegal and it won’t endanger Australians at all and we won’t provoke the ‘terrorists’ by going to war with them....So the recent raids by police are just coincidental...mmm. I do hope he's right. Anyway he won’t go to war unless the Americans say go, mind you it was the Americans who got it so right last time in Iraq ,mmm, as we all know. They installed a government that polarised the people of different sects which in its way created ISIL . Abbott will consult the Americans he says, but he does not consider consulting the Australian people, even though its obvious that the people would support him in this instance. Why he avoids a debate on this war is beyond me. Sovereign borders comes to mind as a good example, if he was honest and open with the Australian people instead of holding press conferences that provided no information they would support him know doubt. His calming strategy in this instance is counter productive as usual. We'll have well publicised body-searches at Australian football finals in case people have got atomic weapons up their clackers. Abbott says, ‘Carry on with your lives as usual’, but be aware the terrorists might be strapped with bombs at the next Grand Final’. If Mr Abbott's calming strategy is to frighten the bejesus out of us it is working, if its about reassuring the Australian public it misses by a mile I'm sorry. I think it smells a bit like taking advantage of an opportunity-- politics and the polls. I'm sure someone prior to the last election mentioned open and transparent government.